We appreciate your feedback about your support experience with SkyVerge, developers of WooCommerce Order Status Manager. This helps us maintain high standards on the WooMarketplace, and helps SkyVerge improve. 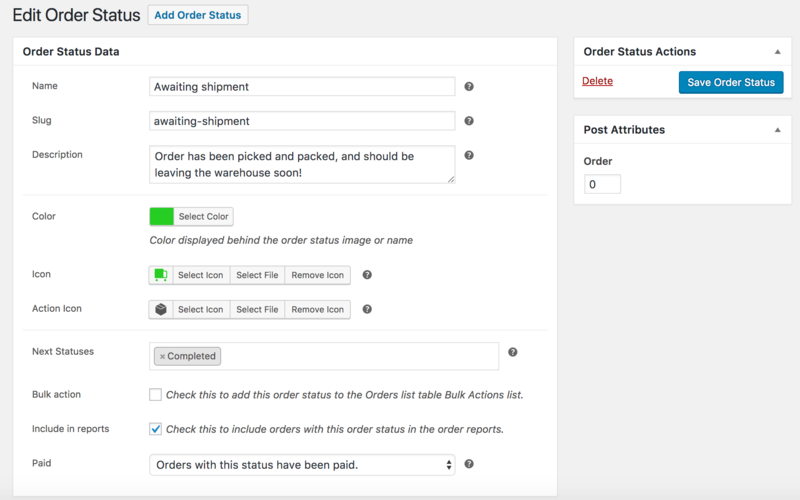 The WooCommerce Order Status Manager allows you to create, edit, and delete custom order statuses and integrate them seamlessly into your WooCommerce order management flow. You can also edit core order statuses and trigger new order emails based on status changes. Custom order statuses will be used in your orders list, and can even be integrated into the order actions or bulk actions for a completely seamless fulfillment workflow. New order emails can also be triggered as an order status change notifier. You can trigger emails based on changes between custom statuses or core statuses so that customers and/or shop admins are always informed of order updates and changes. You can add a new order status and select an icon to display in the orders list (which replaces the text badge for a status name). Action buttons can also be added if this will be used as “next status” by another status in your order flow. You can also add next statuses to determine which actions buttons should be displayed for this status. 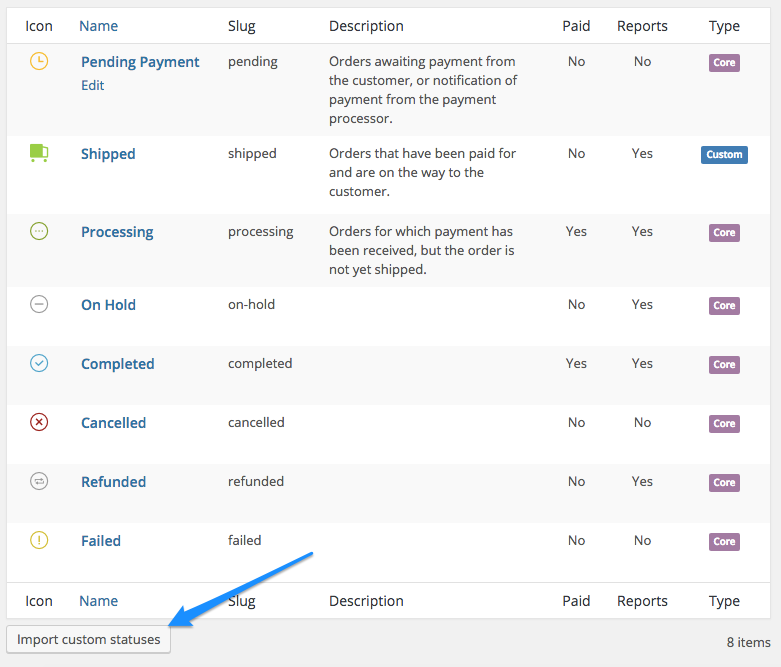 You can edit a core WooCommerce order status to add “next statuses”. For example, you can add a custom status as a next status for “processing” orders, which will display your custom status action button for any processing order. This makes order management simple, fast, and easy to use, as custom statuses are completely integrated into the orders workflow. Customers can be frustrated by order management when they don’t know where their orders are. While your statuses are meant to help in your fulfillment workflow, displaying a status like “Manufactured” or “Assembling” doesn’t tell customers anything. You can now set a description for any status (including core statuses!) that will be shown to customers when they mouse over the order status. 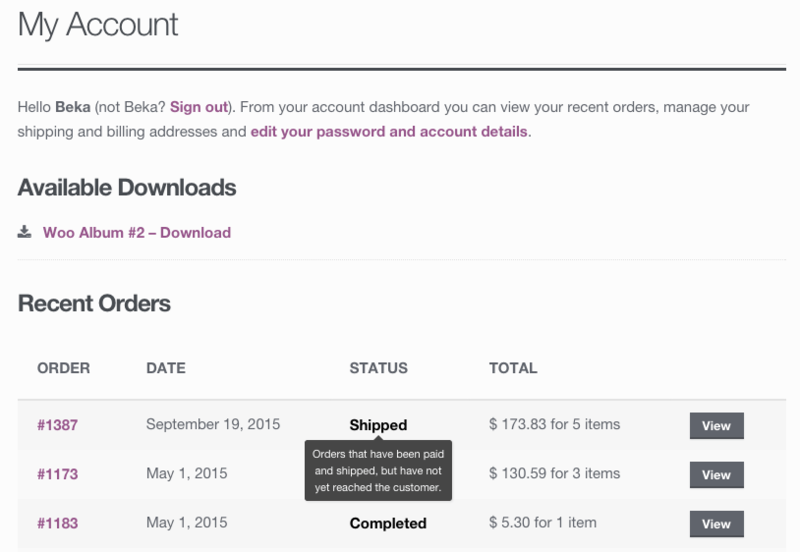 Go to WooCommerce > Settings > Order Statuses, and set up new statuses or email triggers. Edit your email content if needed. That’s it! Sit back and enjoy custom WooCommerce order statuses and automatic emails!